BATON ROUGE – The Board of Supervisors for the University of Louisiana System welcomed two new members as well as one reappointed member during its meeting today. Carl Shetler of Lake Charles was reappointed to another six-year term representing the 7th District, making this his fourth appointment on the UL System Board. He holds a Bachelor of Science in Business Administration from Auburn University and a Certification in Education and Master of Science in Administration and Supervision from McNeese State University. A former UL System Board Chair, Shetler also serves on the Lake Charles Memorial Hospital Board. “I am very happy to be reappointed. I have been on this Board for 16 years and this will bring me to 22 years of service. I want to be a part of this group. I don’t want to be a single member of this group, and, I believe, that is how this Board operates,” said Shetler. Jimmy Faircloth, Jr. of Alexandria begins his first term representing the 5th District. Founder and managing member of The Faircloth Law Group, L.L.C., he served as Executive Counsel to Governor Bobby Jindal from 2008-2009. 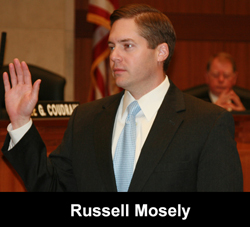 He holds a Bachelor of Science degree in Management from Louisiana Tech University, a Juris Doctor from Georgia State University and a Master of Laws in Litigation from Emory University. Pharmacist John LeTard will represent the 6th District. A graduate of the University of Louisiana at Monroe, LeTard is owner of Medical Pharmacy West in Zachary, Louisiana and Bush Hill Plantation, Inc., Trophy Deer Hunting Preserve. He also served in the U.S. Army where he earned the rank of First Lieutenant. “I am honored to be here as a new Board Member, and I look forward to serving,” said LeTard. In addition to swearing-in members, Board Officers received their Oath of Office at today’s meeting. Chair Winfred Sibille of Sunset, Vice Chair D. Wayne Parker of Choudrant and Parliamentarian Russell Mosely of Baton Rouge began their second consecutive year in their respective leadership positions. “I take this job very seriously, and I pledge to do the best I can to support this Board. I am confident we will get through this year and be better on the other end of it,” said Parker. Founded in 1974, the Board of Supervisors are comprised of 16 members – 15 appointed to six-year terms by the Governor and one student member elected each May. Currently, there are 14 members serving. For more information about the UL System and the Board of Supervisors, visit www.ulsystem.edu. EIGHT UNIVERSITIES STRONG: The University of Louisiana System is the largest higher education system in the state enrolling over 83,000 students at Grambling State University, Louisiana Tech University, McNeese State University, Nicholls State University, Northwestern State University, Southeastern Louisiana University, the University of Louisiana at Lafayette and the University of Louisiana at Monroe.